The Hesburger Children's solves two problems in one fell swoop: hunger and nothing to do. Delicious and fun! The meal themes are changed every two months. Children's meal: Hamburger, regular fries and a Trip raspberry juice box (0.2 l) and a toy or other children's product (changed periodically). 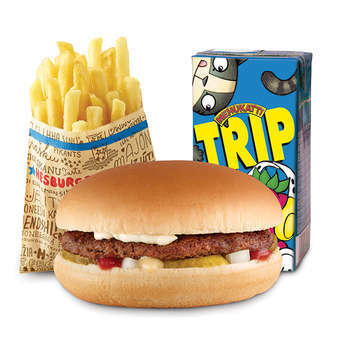 • You can replace Hamburger to Cheeseburger, 4 pc nuggets/soyfingers+dip or Hesburger Gluten free burger. • A mini salad or baby carrots can be substituted for fries. • A soft drink (0.25 l), oat drink (0.25 l), fat-free milk (0.2 l), whole orange juice (0.25 l) or whole apple juice (0.25 l) may be substituted for the juice box.